68 ethnic groups, each with its distinctive style of weaving and embroidering cotton and silks. 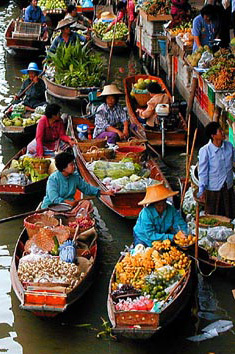 These enticing southeast Asian countries have many similarities – and many contrasts. You'll see vibrant cities in Thailand, very tourism-oriented as well as remote hill tribes , elephant camps in Chiang Mai and gorgeous islands off the coast, filled with both simple and luxury accommodations to suit the budget of every traveler. Laos is very laid-back, having only just begun to see tourism coming into the country. The capital of Vientiane has beautiful wats (temples), wide tree-lined boulevards, architecture from the Soviet, Chinese and French incursions. 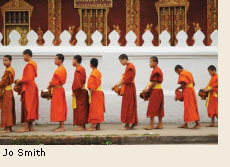 The UNESCO site of Luang Prabang also has many beautiful wats, saffron-robed monks strolling the lantern-lit streets and many cafes and coffee shops, and a great night market. 68 different ethnic groups live in remote villages, some along the Mekong River, which runs through the entire country; others live inland and in the mountains; all practicing their craft and agricultural heritage as they have for centuries. The south is more tropical, where almost all of the rice is produced. You'll find interesting pre-Angkor Wat ruins, and there are lovely island areas with good small hotels. Watchfulness and simple common sense recommended, as anywhere in the world. Lock your hotel room; place valuables in room or hotel safe; carry copies of your passport, driver’s license, insurance cards and credit cards separate from your handbag; don’t pull out a wallet full of cash in public – keep some bills and change in your pocket and the rest in a money belt you open in a private area. Don’t bring or wear valuable jewelry or watches. Respect is a key word in travel anywhere, especially at religious sites. Bring a long sleeved shirt or scarf to cover bare arms and do not wear shorts; some monks may bring your attention to this, others are too shy to do so. Always take your shoes off before entering a temple, as well as hats or other head coverings. It is thoughtful to make a donation, any amount, to the temple. Women should never touch a monk. If a woman wants to hand him something, it should be placed on the monk's "receiving cloth" or within his reach. Do not ever raise your voice or be aggressive, which causes embarrassment to the local people. An important Asian concept: do not make a local person “lose face”. “Big face” equals prestige; “losing face” brings embarrassment to a local and will end any chance of a sensible resolution to a dispute. Take a deep breath, calm down and remember, you are not in the western world. It is customary to remove your shoes before entering someone’s home. Never point your feet towards people, and never towards a sacred image, such as a Buddha. Watch how the local people sit, and fold your legs to the side, with your feet pointing backwards. The head, in Asia, is sthe symbolic highest point – never pat or touch an adult on the head. Bow your head slightly when meeting elders or monks as a sign of respect. Delicious food is available everywhere, but at the markets, only eat hot food cooked in front of you, and do not eat raw fruits or vegetables you haven't washed (with bottled water) and cut up yourself. Salads are safe in good restaurants. Vegetarians and vegans will be delighted to know you can order any dish without meat or fish. You can ask for varying degrees of spice in dishes you order. Watch the locals for how and when to begin the meal. Good point to know: never stick your chopsticks upright into a bowl of rice, as it symbolizes death. In Thailand, however, one eats with a fork and spoon. Laos is famous for its beer, Beer Lao was rated the continent’s finest by Time magazine. Beer and wine are quite expensive in Thailand. Local whisky is a fiery brew made from distilled sticky rice. Note that Buddhism condemns intoxication, so moderate drinking strongly suggested. Always drink bottled water, available from local shops or the bar in your hotel. Use it also to brush your teeth. Filtered water is used in ice cubes in better hotels and restaurants, but beware of asking for ice in sidewalk cafes, as you risk a stomach upset or worse. Carry any prescription meds in your carry-on case, in their original containers, and bring along enough for your trip plus a couple of days, in case of delay. Take along a list of your meds in case of emergency, using the generic names in case your brand isn’t available. Your guide will help you. Thailand has some excellent facilities, especially in Bangkok. Many expats live here. Again, rural areas will not have reliable facilities. Talk to your guide and/or hotel for assistance. Laos does not have good, reliable healthcare facilities – the closest are in northern Thailand. It is difficult to find reliable medical care in rural areas – contact your embassy for recommendations. Talk to your guide and/or hotel for assistance. In your carry-on, put all prescription drugs in original containers. Carry a list of your prescriptions, including their generic names; have a dental check up before you leave your hometown; bring an extra set of reading glasses; check with the Centers for Disease Control for information on malaria in areas you’ll be traveling; if you have a chronic disease, have your doctor provide you with a letter on his/her letterhead explaining what the condition is and how it is being treated – just in case you need medical help while traveling. Be prepared. The Thai currency is the “baht”. Thailand’s larger cities will have several ATMs. Visa and Mastercard are widely accepted in some shops, more upscale hotels and restaurants, but always have some local cash on hand, just in case. The U.S. dollar is widely accepted, as well as Euros. The Thai baht is also accepted in Laos. Lao currency is called “kip”. Laos has very few ATMs, so don’t rely on them. Vientiane has a few. Bring enough cash to pay your bills and purchases. Check www.oanda.com for exchange rates. Not a traditional practice, but foreign travelers have introduced the practice. It is greatly appreciated, as salaries are low, especially in the poorer regions. Very much a part of the culture, inherited from ancient Chinese and Indian traders. The key is not to engage in the practice if you are really not interested. You can ask a price just to get an idea, but once you engage in offering a lower price, the game is on. Always be patient, do not be angry, and counter with half the asking price – only if you are really interested in purchasing. Be prepared to pay somewhere in the middle. Do not bargain just to see how low a price you can get and then walk away, as that is a great insult. You may of course say "no thanks, I am not interested" and end it there. Be aware that this may encourage the shopkeeper to lower the price! And be aware that no one will sell anything if there is not some profit to be made. Travel, medical and emergency evacuation insurance is essential, especially when traveling in rural areas. Purchase a policy covering the entire cost of your trip (land and air) and ask about pre-existing conditions. Noble Journeys recommends, but is not responsible for, policies through Travel Insured Interntional at www.travelinsured.com or (800) 243-3174. Should you choose this company, please give our agency #46716. You are visiting cultures quite different from those in western countries. Do some research and find appropriate greetings and thank yous. Try to understand local culture and customs – the Lonely Planet guidebooks have good information. Use trash containers for any unwanted paper, wrappers, etc. Ask your hotel if they follow a “green” procedure with sheets and towels. I will be posting more tips in the future, but do consider traveling to these wonderfully unique countries. Contact us or visit our Thailand and Laos main page for more information about an exciting Thailand and Laos vacation.